As part of America's continued initiative to show greater military readiness and fighting capability in Europe in order to reassure NATO allies and deter Russian aggression in the region, USAFE has sent six of its F-16CJs from Germany to train with some of the oldest jets in NATO, Romania's ancient MiG-21 Lancers. Reading this you are probably taken aback by the fact that a NATO member is still flying MiG-21s. Although the MiG-21's inferior in pretty much every way to their modern 4th generation fighter counterparts, Romania's MiG-21s are some of the most advanced versions of the type ever conceived. Because of limited funding, Romania has not been able to purchase a western fighter for its air policing mission, yet alone for its ground attack mission requirements. In order to meet NATO standards, they put their best MiG-21 Fishbed models through a deep upgrade program with the help of Israeli aerospace defense contractors. What they ended up with was a fairly capable basic fighter platform at a bargain basement price, not just when it came to its acquisition cost but also its operational cost as well. The Lancer upgrade program saw some 108 MiG-21s receive western standard navigation suites for bad weather and night flying, a radar warning receiver and self defense suite, a HOTAS control setup for improved control ergonomics, an advanced helmet mounted display, a new weapons control interface and a partial 'glass' cockpit. The jets could also use Israeli-built weapons such as the Python series of air-to-air missiles and an assortment of laser guided bombs. The Lancer-A variant is used for ground attack and can carry the Rafael LITENING targeting pod, while the Lancer-C version is used for point air defense and carries the modular Elta EL/M 2032 pulse doppler radar within its air intake spike. Although 108 jets were upgraded, only about three dozen remain in service with Romania today and many parts have been cannibalized from other airframes in order to keep the fleet's readiness high. These remaining aircraft will be partially replaced starting later this year, with used F-16AM MLU Vipers coming from Portugal. As more used F-16s are bought, they will eventually replace Romania's entire MiG-21 Lancer fleet in full. So at first glance, what clearly appears to be a readiness drill and show of force opportunity for the USAFE and the Romanian Air Force is also a highly valuable and unique training opportunity due to the highly dissimilar fighter aircraft involved. On one hand, you have Romanian MiG-21 Lancer pilots who get a great opportunity to learn about their new (to them) fighter first hand and to USAF F-16CJ pilots get to fly with and against one of the most legendary fighters of all time, the MiG-21. Additionally, there are not just any MiG-21s, but they are the most potent form of the jet ever that are being flown by some of the most experienced MiG-21 drivers in the world. "We just had a once-in-a-life-time opportunity to fly against the Romanian MiG-21 fighter pilots today. Hopefully it was just as rewarding for the Romanian pilots... We all have a lot of learning to do. We debriefed and talked about what we saw, what we did and what we could have done better in fighter pilot fashion — always trying to make each other better." USAFE crews had to come to Romania in advance to setup a temporary emergency arresting gear for the F-16CJ to use should they have an in-flight emergency such as a hydraulic failure. It truly is dissimilar air combat training (DACT) at its best and similarly upgraded MiG-21s are known to be very tricky aircraft to fight against when flown by highly trained pilots using non-traditional tactics. During the Cope India air warfare exercises of the last decade that pitted USAF F-15Cs against a wide array of Indian Air Force aircraft, including the Su-30MKI, it was the similarly upgraded MiG-21 Bisons, with their small radar cross-section, their Israeli-built jamming pods and their helmet mounted sights tied to high-off boresight heat seeking missiles that gave Eagle crews the worst time. Beyond aerial jousting high in the skies over Campia Turzii, Romania, these bi-national exercises are meant to strengthen the ties between the two militarizes by having them work side-by-side with one another. For every jet temporarily deployed there are literally dozens of ground support folks, from crew chiefs to administrative personnel, who get the opportunity to make new friends and learn from how a unique NATO ally does its air combat business on a shoe-string budget. "I believe the next two weeks will be a great opportunity, not only to increase our efficiency, but mostly to tighten up the bonds between the U.S. and Romanian air force." Beyond international goodwill and what are sure to be some pretty interesting aerial engagements, the 480th Fighter Squadron's trip to Romania, which is the nation located closest to Russia's Crimea who are also holding its own air combat drills this week, is all about being able to fight together should it ever come to that. Considering how stretched America's ever shrinking air power fleet is, and how small the USAFE's in situ fighter contingent has become over the last 25 years, understanding even the diminutive MiG-21 Lancer's capabilities, and putting them to work during a time of crisis would be crucial. "It's an honor to be here and train side-by-side with the Romanians... We hope by being here we can increase the cooperation between our countries and NATO partners and be able to provide increased security in the Eastern Europe region." Under pressure from the current threat posture of its nearby Black Sea neighbor, Russia, Romania's hybrid eastern block fighter fleet will finally give way to a modern western fighter aircraft soon. Which means one less operator of the MiG-21 internationally, an aircraft that has served and remained relevant for over 50 years. 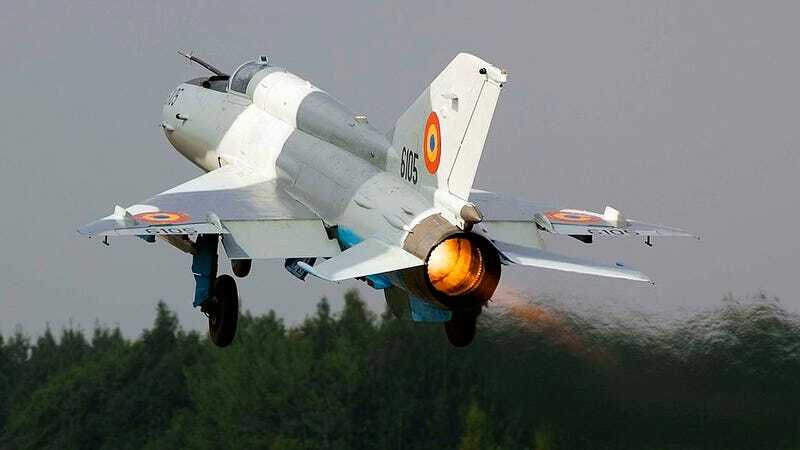 And with its overdue retirement, US fighter aircraft will only have two NATO partners left with MiG-21s, which are Bulgaria and Croatia, and neither of those forces feature the capabilities of the Romania's Lancers. Source: USAF. Photo Credits: top shot: MAPN/Wikicommons. MiG-21 taxi shot: Tim Felce (Airwolfhound)/wikicommons. All other photos USAF/public domain.